Add to your existing Cleasby Complete fall prevention warning line system with separate posts that allow you to expand the coverage area along the perimeter of the roof. Safety equipment for fall protection provides an affordable, valuable way to allow workers to remain productive and protected when working near to the roofs’ edge. 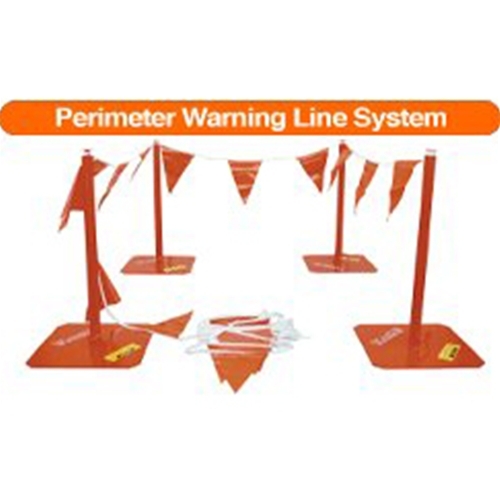 The Cleasby Complete Warning Line System consists of posts, bases and pennant line that can be set up on residential and commercial roofing jobs. In addition, Cleasby provides separately each part of the full system in order to allow you to add on as needed and ensure that the active work space is fully protected. This allows you to completely customize your order, and avoid costly waste or dangerous injury. The W00075B posts can be ordered in separate quantities, as the original system only includes 4 posts. These stanchions are made from a durable, heavy duty pipe that is fabricated with a slip fit connection to easily assemble in a short amount of time. Be sure that you also order corresponding base plates as well, as the posts do not come with additional pennant line or bases. Order by phone here at Intech Equipment and Supply, or give us a call to discuss the best set up – Determining the amount of coverage needed can impact your purchase decision and our pros can assist you in determining whether it be best to purchase separately or to purchase multiples of the Cleasby Complete Warning Line System. Make safety and fall prevention the number one priority on your jobsites now! With Cleasby products here at Intech Equipment and Supply, this task has never been easier. Our knowledge combined with extensive industry experience from the pros at Cleasby provides a winning combination. Browse traditional roofing equipment and safety equipment by Cleasby as well as other top industry manufacturers.